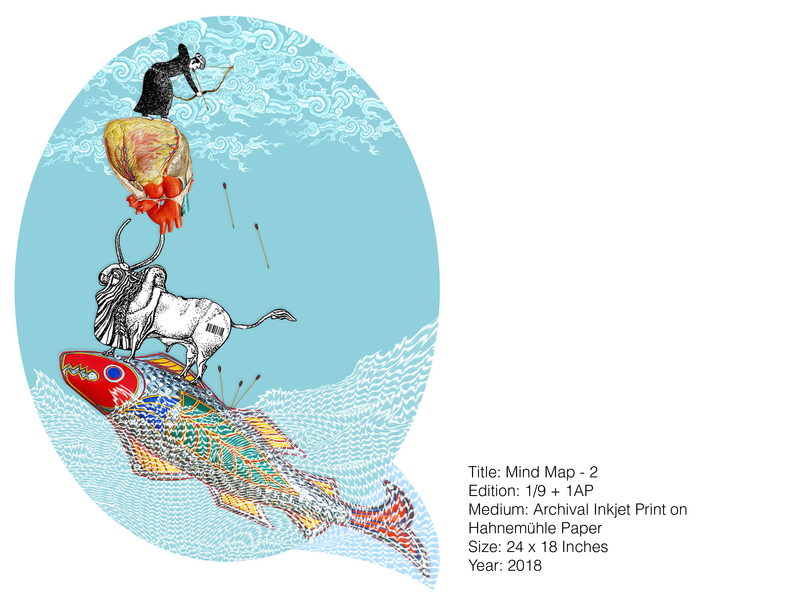 This solo show takes us on a journey spanning across several hundred years with a flood of drawn iconic imagery that is artfully placed and integrated to bring together thought-provoking meanings and questionable ideologies for its viewers to sift through. 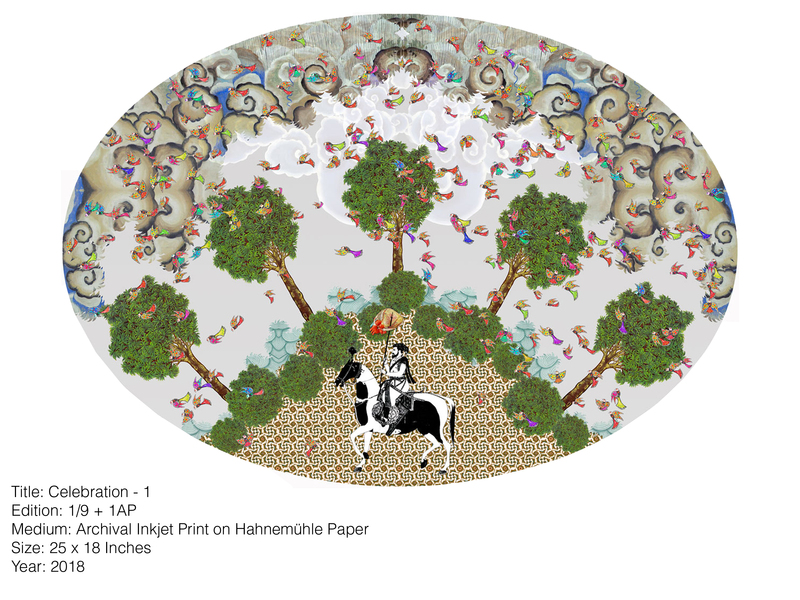 It is the human existence in nature and beyond where man’s conduct is being questioned amidst the oval frames and gravity inspired balancing acts, drawing us in to a narrative which displays visuals not only from the Mughal Era but also blends in the current Era of Google Maps, with loud and bright Truck-Art inspired icons sown masterfully in-between. It is the intricately woven surgical hearts which is not only the star icon of this show but also serves as an agent of philosophical dialogue which mainly threads around the actions of man which may have likely resulted through infliction of pain to a human subject whose heart was obtained for the sake of one’s muse. This leads us to a few logical questions: Are humans cruel by nature with disregard to what they inflict on others? Should one rejoice in celebration at one’s gain at the expense of another’s pain? Should stealing be justified or is it always deemed to be wrong? Should class divides be paid much attention to in this day and age? The series of images titled “Celebration” is a set of 3 images, providing thought-provoking visual imagery in which a human figure is found to be interacting with the surgical human heart within the backdrop of seas, trees, earth, mountains and skies. In one print the human figure is busy celebrating the human heart that most likely was obtained by force, being held up on the edge of his spear in a victorious fashion. The Mughal figure takes us all the way back in to the historical 1500’s and then simultaneously jostles us right back in to the present with the birds in the sky, all done up in popular Truck-Art style which has become a local cultural icon and also has been a source of blatant inspiration for many artists and designers over the past decade. 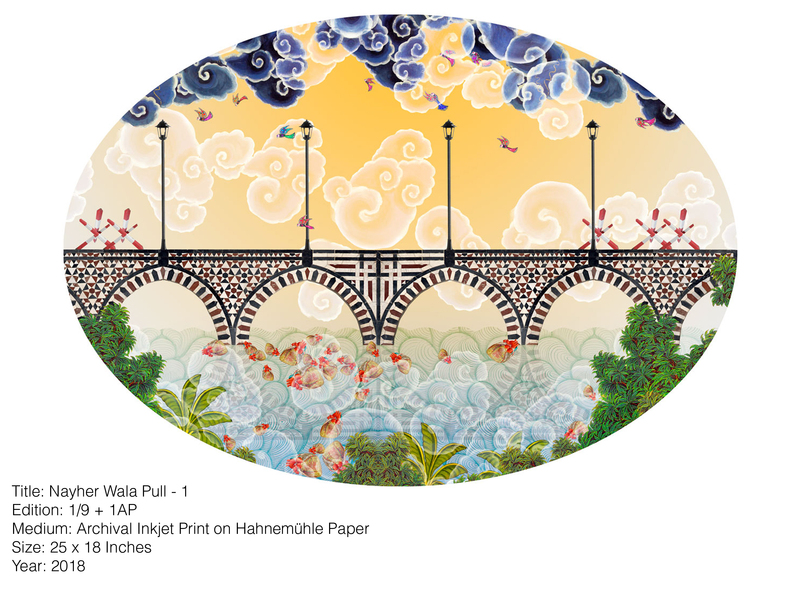 An ongoing presence of swirly clouds borrowed from the Persian Miniature Art has its own character to lend in bringing together this assembly of diverse iconic imagery. A Mughal figure is also visible in the prints titled “Nayher Wala Pull” and the “Mind map 2”. “Mind Map -2”shows the debauchery of man on its surroundings and on the very foundation he stands on. The Truck-Art inspired fish which is proportionally the largest element in the entire image is indeed the target of man’s amusement for he is shooting arrows at the very fish which is serving as the foundation of his balance. This leads us to another logical question: Is it the very nature of man to attack the very foundation that he is standing on? The presence of human heart as the balancing ground under the feet yet again begs the question as to who all was deprived of a chance to live for the sake of man’s pleasure. “Nayher Wala Pull” prints provide a great many contrasts and innuendos amidst plethora of elements pulling at you from across the entire frame with varying degrees of intensities. 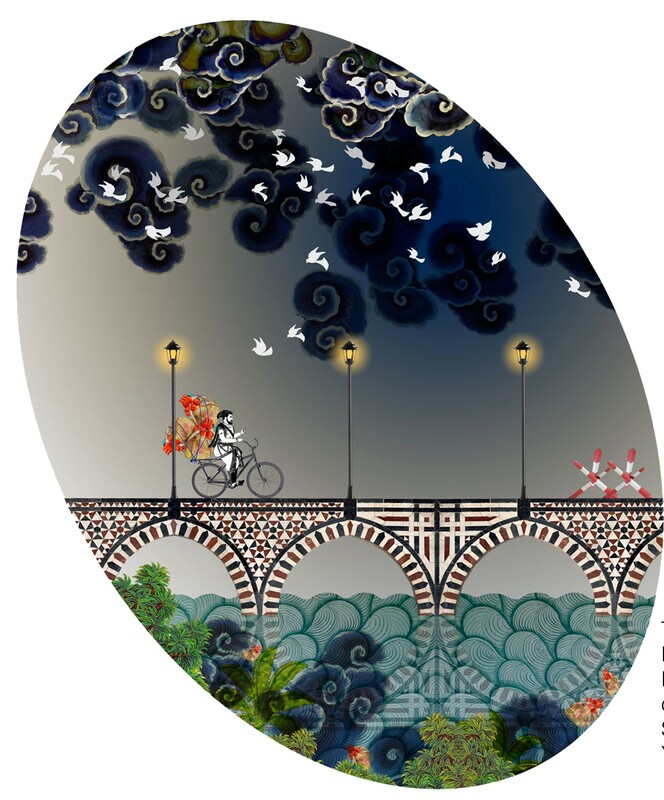 The stark contrast of day and night in both the frames is the most obvious one to begin with, leaving the reflections of the bridge to be visible in the waters. The Mughal figure is found to be cycling away with the best of human hearts he found in the dark night; possibly an opportunity for another thought-provoking dialogue. Truck-Art inspired life elements along with the presence of Mughal Era figures keeps the viewer in perpetual awe at the time and era of the frame in question. The omnipotent presence of the Google Map Pins pulls us back in to the present day. Normally we see the pin dropped in the Google Map, whereas here, the map is found within the pin itself, creating an interesting juxtaposition. 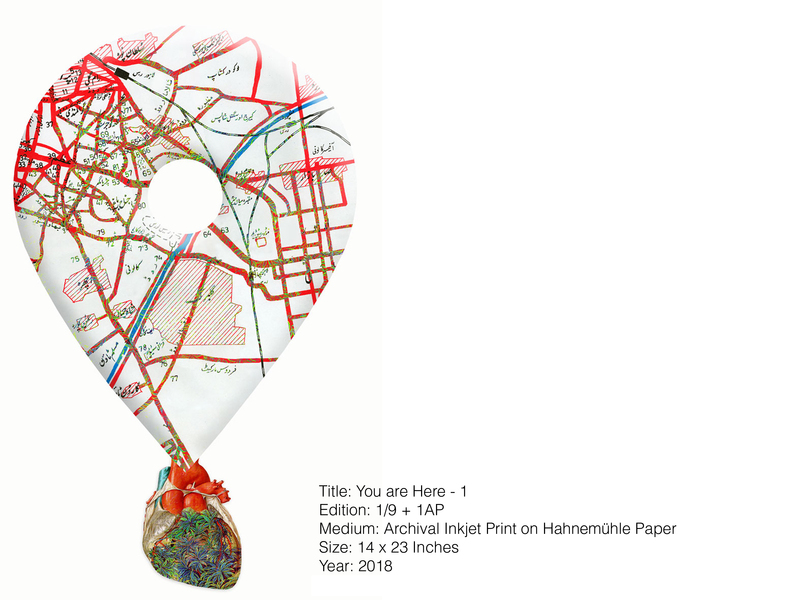 Lahore map is seen to be incorporated in the pin itself, drawing tacitly on various divides created by the “Nahyer”(canal) that runs through the city being a source of social and cultural divide between the residents of the city. A divide that the artist seems comfortable presenting and questioning. The balancing element is visible in “Seven Skies” where the water, earth and skies are all piled together with swirly Persian Clouds in its majestic aura, incorporating the iconic Truck-Art birds and a popular horse figure with wings up in the Skies ,whereas down South, is the Truck-Art inspired fishes swimming away in oblivion. It is the angels and fairies done up in black and white and their festivities which provide a fruitful contrast, tying together the entire image with such mastery that it leaves the viewer searching for invisible threads which binds the entire image of such diverse iconic elements with that degree of cohesion. 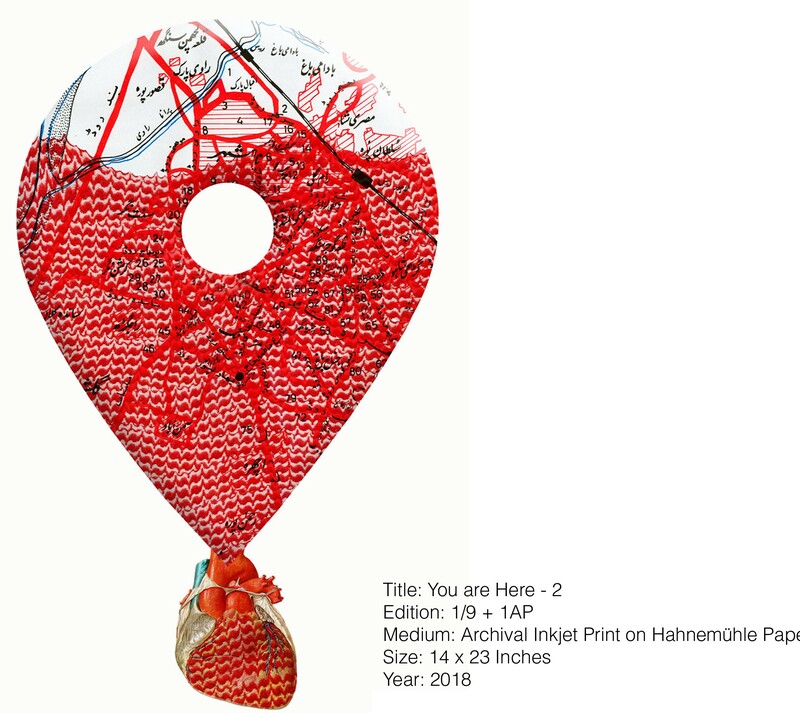 These Mind Maps which do not adhere to any hierarchies is a product of artist’s liberties which brought together the by-gone eras with the current cultural icons, even intercepting the medical boundaries with the persistent presence of a purely medical-textbook heart, allowing it and accepting it in to the art world with open arms. All these “found images” are indeed set out to take the viewer through the varied timelines so as to “free their minds from the limitations of real time and to enter in to an imaginary world”. In the meanwhile, creating a subject which has a high degree of potential for initiation of a much needed social dialogue which can become the very agent of change and growth of society’s future ideologies.